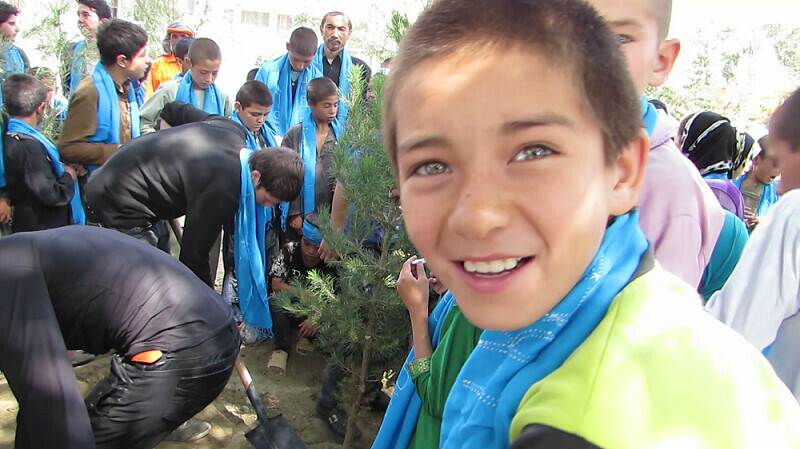 On 27th August 2015, Sakina and Inam, with fellow Afghan street kids and the Afghan Peace Volunteers, held a mock funeral for weapons and celebrated the establishment of a green space in Kabul. 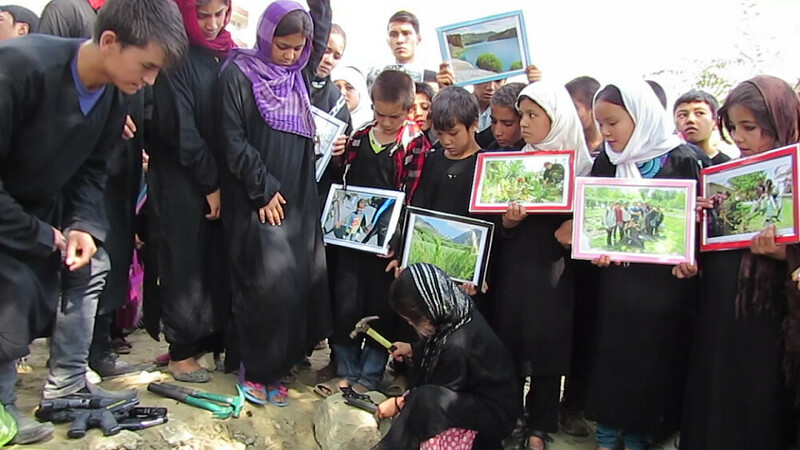 Dressed in long black coats, they broke and buried toy guns in a small spot where, over the past two years, they have been planting trees. Sakina breaks a toy gun before burying it. Inam and other street kids await their turn. Inam, a bright-eyed ten year old, caught the group’s energetic desire to build a world without war. “I kept toy guns till about three years ago,” he acknowledged with a smile. On the same day, Nobel Laureate Oscar Arias Sanchez, ex-President of Costa Rica, was in Mexico for the Arms Trade Treaty’s First Conference of States Parties. No mother, Guatemalan or Afghan, wants her children to be killed in war. 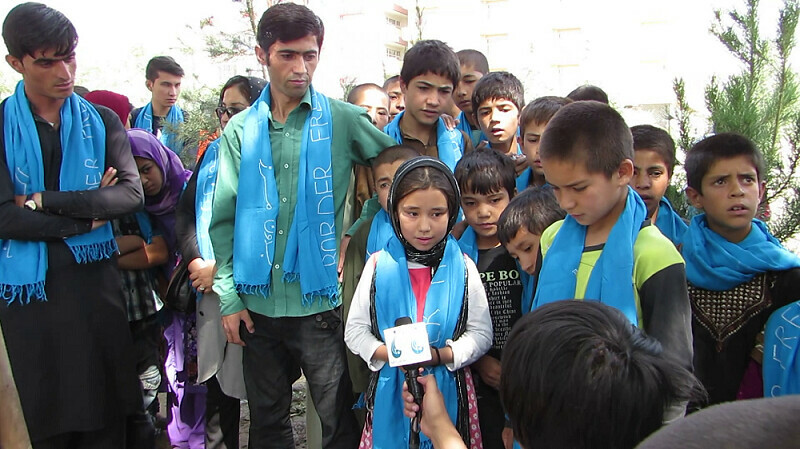 I’m confident that the children of Afghanistan were also in his thoughts, especially since he had a brief personal connection with the Afghan Peace Volunteers in 2014, having been part of a Peace Jam video message of solidarity to the Volunteers, wearing their Borderfree Blue Scarves which symbolize that ‘all human beings live under the same blue sky’. I thank Mr Oscar Arias Sanchez for his important work on the Arms Trade Treaty, though I sense that an arms trade treaty isn’t going to be enough. Afghan children are dying from the use of weapons. To survive, they need a ban against weapons. Regulations about buying and selling weapons perpetuate a trade that is killing them. I saw Inam and other child laborers who work in Kabul’s streets decisively swing hammers down on the plastic toy guns, breaking off triggers, scattering nozzles into useless pieces and symbolically breaking our adult addiction to weapons. Children shouldn’t have to pay the price for our usual business, especially business from the U.S., the largest arms seller in the world. U.S. children suffer too, with more U.S. people having died as a result of gun violence since 1968 than have died in all U.S. wars combined. U.S. weapon sellers are killing their own people; by exporting their state-of-the-art weapons, they facilitate the killing of many others around the world. After burying the toy guns, surrounded by the evergreen and poplar trees which they had planted, the youth shed their black coats and donned sky-blue scarves. Another world was appearing as Sakina and Inam watched young friends plant one more evergreen sapling. Inam knew that it hasn’t been easy to create this green space in heavily fortified Kabul. The City Municipality said they couldn’t water the trees (though it is just 200 metres away from their office). The Greenery Department weren’t helpful. Finally, the security guards of the Afghan Independent Human Rights Commission just across from the garden, offered to help, after the Volunteers had provided them with a 100-metre water hose. Meanwhile, in the rest of the country, according to figures from the National Priorities Project, a non-profit, non-partisan U.S. federal budget research group, the ongoing Afghan War is costing American taxpayers US $4 million an hour. It is the youth and children who are making sense today, like when Nobel Laureate Malalai Yousafzai said recently that if the whole world stopped spending money on the military for just 8 days, we could provide 12 years of free, quality education for every child on the planet. Sakina speaks to a T.V. reporter. Rohullah is on her right, Inam on her left. It wasn’t a protest. It was the hands-on building of a green spot without weapons, and an encouraging call for others to do so everywhere. Hakim, ( Dr. Teck Young, Wee ) is a medical doctor from Singapore who has done humanitarian and social enterprise work in Afghanistan for the past 10 years, including being a mentor to the Afghan Peace Volunteers, an inter-ethnic group of young Afghans dedicated to building non-violent alternatives to war. He is the 2012 recipient of the International Pfeffer Peace Prize.